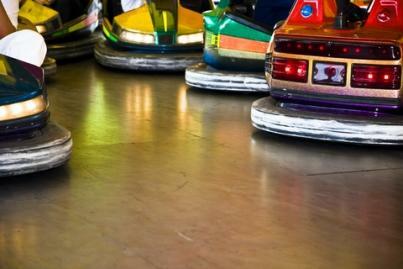 Finding indoor amusement parks in Illinois might be just what your family needs to beat the freezing temperatures. While indoor amusement parks do not offer the thrills and speed of outdoor amusement parks, they are ideal for smaller kids. Without the elements to contend with, indoor parks can provide a much needed break from the monotony of a winter vacation. As the name implies, Safariland is an indoor theme park built around the idea of an African Safari. 62,000 square feet of space is home to not only the largest indoor roller coaster in Illinois, but also a few rides, a Go Kart track, and a flight simulator. If you need to stop and eat, the Atlantis restaurant sits right inside Safariland so there's no need to leave. You can also find a few carnival style games in addition to a full bowling alley. Safariland is a one-stop family entertainment haven. Grizzly Jack's is an all-in-one amusement park package. Boasting both an indoor water park and an indoor amusement park, Grizzly Jack's is an exciting place to stay for vacation. The Enchanted Forest Indoor Amusement park is geared towards the smaller crowd. Parents should be mindful of height restrictions before arriving; to really enjoy the experience, kids need to be taller than 36 inches. Children shorter than that cannot ride the rides. One thing to note is that the indoor water park is only available to guests, but you can buy day passes to the amusement park year round even if you are not a guest at the resort. Go Bananas is a relatively new addition to the set of indoor amusement parks in Illinois. While it is not the largest amusement park, it does offer a few rides for the younger set including a roller coaster and white water rapids simulator. Admission is free but that doesn't mean riding is. Parents have the option of buying bracelets for unlimited fun or ride tickets to pay for each ride individually. Packages are available as well so you can buy tickets for rides, pizza and drinks for your whole crew all in one location. Odyssey Fun World is a cross between all around entertainment center and amusement park. It is a franchise, and they only have rides at the Naperville location. Guests can enjoy rides such as bumper cars, a kiddie land free fall ride, a virtual reality simulator and an elevated ride that spins. Rides are $3 a piece which might seem pricey. Older kids might enjoy the laser tag or paintball courses, and for many families that makes the trip worthwhile. Before you go, make sure that you do a little research. While many indoor amusement parks offer package deals, some do not and you will have to purchase tickets for each ride. Most, if not all of the indoor amusement parks in Illinois cater to preschoolers. However, it is still a good idea to check for height requirements for the various activities. Finally, remember to bring a pair of socks and most indoor parks require socked feet to play in some of the areas.